More rooms will be released throughout April, giving you the chance to earn additional points as well as 111 additional prizes, including a green kitchen makeover valued at $18,000! Just click on the [+] plus signs in each room to learn about green choices and earn points. Just register with RecycleBank and start playing. What can you do with your RecycleBank points? 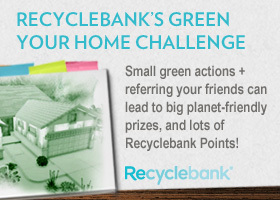 RecycleBank points can be redeemed for various prizes including high value coupons, magazines, gift cards and more. Many of the coupons are marked down for Earth Month, so you should be able to pick up some nice savings with your points! My current favorites are the $2/1 Naked Juice (30 pts. ), $1/1 Honest Tea (10 pts. ), and $2/1 Wonderful Pistachios (50 pts.). Save up 200 points and you can select FREE product coupons for Happy Baby, Wonderful Pistachios, and Everybody’s Nuts! Or redeem your 115 points right now for a one-year magazine subscription to Everyday Food, Marie Claire, Whole Living and more. What are you savings up your Recyclebank points for? I keep cashing mine out for free McCaffe’s from McDonalds! Thanks for this – I “bought” the Harris Teeter coupon. It’s going to make shopping much easier this month since Target only has the food I want in stock 50% of the time. I recycle every week. I don’t know how to get this recyclebank program.. any help? Unfortunately the recycling program is not available in all areas, but they do have some form letters that you can send to your waste management providers to encourage them to sign up! Everyone can take advantage of the opportunities to earn points that I’ve outlined above though. Even though my area does not participate in Recyclebank, I have earned a good bit of points that I have redeemed for FREE Fancy Feast can cat food. I love this program, since I believe in recycling or re-purposing any way.